Food safety is a scientific discipline, which describes handling, preparation, and storage of food to prevent foodborne illness. In all countries, food is governed by a complex of laws and regulations that set the government’s requirements to be met by food chain operators to ensure the food is safe and of adequate quality. Food can transmit diseases from person to person; therefore, food safety is a necessary concept in food industries since it even focuses global consumers. Meat industry is one of the major rapidly developing industries throughout the world. There, major food safety incidences include biological, chemical, or physical hazards. ISO 22000: 2005 international standard specifies the requirements for a food safety management system that involves in interactive communication, system management, prerequisite programmes, and Hazard Analysis Critical Control Point (HACCP) principles. Latest standard for food safety is Food Safety System Certification (FSSC 22000) and it slightly differs from ISO 22000 food safety standard. 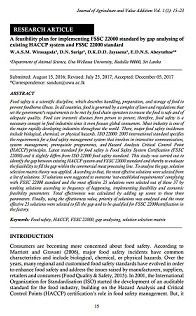 This study was carried out to identify the gap between existing HACCP system and FSSC 22000 standard and thereby to evaluate the feasibility to fill the gap within the commercial meat processing line. To analyse the gap, solution selection matrix theory was applied. According to that, the most effective solutions were selected from a list of solutions. 37 solutions were suggested to overcome ‘not-established requirements’ complying with FSSC 22000 standard and the most effective 25 solutions were selected out of those 37 by ranking solutions according to frequency of happening, implementing feasibility and economic feasibility parameters. Total effectiveness was calculated by adding up scores to these three parameters. Finally, using the effectiveness value, priority of solutions was analysed and the most effective 25 solutions were selected to fill the gap and to be qualified for FSSC 22000certification in the factory. 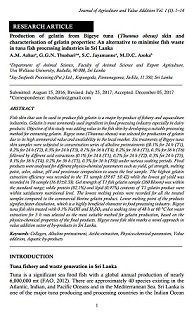 Rubber foliar diseases play an important role in latex yield losses of rubber plantations in Sri Lanka. The frequent use of chemical fungicides to control causative pathogens leads to environmental pollution, become hazardous to human and may lead to the development of new chemical resist pathogenic strains. Trichoderma species are the most widely studied bio control agent (BCAs) against many economically important plant pathogens. Hence, an attempt was made to investigate the antagonistic effect of some native Trichoderma strains on the plant pathogenic fungi; Colletotrichum spp., Corynespora cassiicola, Phytophthora spp. and Drechslera heveae. Foliar pathogens were isolated and identified based on the symptoms, cultural and reproductive characteristics. 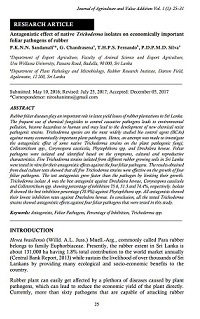 Five Trichoderma strains isolated from different rubber growing soils in Sri Lanka were tested in vitro for their antagonistic effects against the four foliar pathogens. The results obtained from dual culture tests showed that all five Trichoderma strains were effective on the growth of four foliar pathogens. The test antagonists grew faster than the pathogen by limiting their growth. Trichoderma isolate A was the best antagonist against Drechslera heveae, Corynespora cassiicola and Colletotrichum spp. showing percentage of inhibition 75.6, 51.3 and 74.4%, respectively. Isolate B showed the best inhibition percentage (70.9%) against Phytophthora spp. All antagonists showed their lowest inhibition rates against Drechslera heveae. In conclusion, all the tested Trichoderma strains showed antagonistic effects against four foliar pathogens that were tested in this study. The poverty prevailing estate sector is of great importance to the Sri Lankan economy and it should be a source of lesson to other sectors in Sri Lanka. Estate poverty could generally be reduced by diversifying income portfolio of estate households. Although, poverty is a major determinant of income diversification, it is very important to study the household level determinants of income diversification. 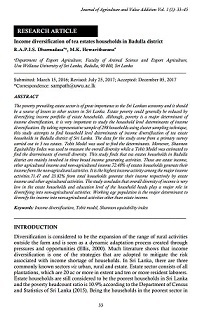 By taking representative sample of 298 households using cluster sampling technique, this study attempts to find household level determinants of income diversification of tea estate households in Badulla district of Sri Lanka. The data for the study come from a primary survey carried out in 5 tea estates. Tobit Model was used to find the determinants. Moreover, Shannon Equitability Index was used to measure the overall diversity while a Tobit Model was estimated to find the determinants of overall diversity. This study finds that tea estates households in Badulla district are mainly involved in three broad income generating activities. Those are estate income, other agricultural income and non-agricultural income.72.48% of estates households generate their income from the non-agricultural activities. It is the highest income activity among the major income activities.71.47 and 23.82% from total households generate their income respectively by estate income and other agricultural activities. The study concludes that overall diversity of income is very low in the estate households and education level of the household heads play a major role in diversifying into non-agricultural activities. Working age population is the major determinant to diversify the income into non-agricultural activities other than estate income. Local roots and tuber crops are important and popular food crops, which are high in carbohydrates, minerals (zinc, iron) and essential vitamins. They also have adaptability on different climatic conditions in addition to contributing to increase agricultural production. Root and tuber crops are versatile staples to address food and nutrition security and produce more food per unit area of land. Also, they are cheap but nutritionally rich compared to many of the other staple crops. Therefore, local roots and tuber crops are vital for sustainable food production in Sri Lanka and are certainly an alternative for achieving food security of the country. Therefore, local roots and tuber crops are an alternative for achieving food security of the country. Today, these crops are facing a threat of extinction in Sri Lanka due to the ignorance of cultivation and consumption. On-farm germplasm conservation process as an in-situ conservation of crop genetic diversity towards improving total agroecosystem conservation and small farmers’ livelihood through the use of local crop resources can provide a better solution to the food security problem and provide economic benefits for the farmers. 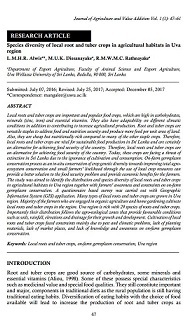 The study was aimed to identify the distribution and species diversity of local roots and tuber crops in agricultural habitats in Uva region together with farmers’ awareness and constraints on on-farm germplasm conservation. A questionnaire based survey was carried out with Geographic Information System (GIS) application. Many types of local roots and tuber crops are grown in Uva region. Majority of the farmers who are engaged in organic agriculture and home gardening cultivate local roots and tuber crops in the region. Uva region is rich with 29 species of roots and tuber crops. Importantly their distribution follows the agro-ecological zones that provide favourable conditions such as soils, rainfall, elevations and drainage for their growth and development. Cultivation of local roots and tuber crops faced constraints mainly due to pest and climatic problems, lack of planting materials, lack of market places, and lack of knowledge and awareness on on-farm germplasm conservation. 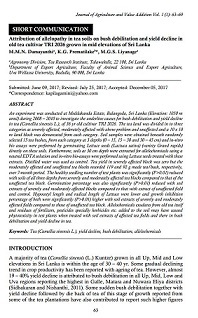 An experiment was conducted at Meddakanda Estate, Balangoda, Sri Lanka (Elevation: 1050 m amsl) during 2008 – 2010 to investigate the underline causes for bush debilitation and yield decline in tea (Camellia sinensis L.), of 36 yr old cultivar TRI 2026. The tea land was divided in to three categories as severely affected, moderately affected with above problem and unaffected and a 10 x 10 m land block was demarcated from each category. Soil samples were obtained beneath randomly selected 15 tea bushes, from each category at 3 depths (0 – 15, 15 – 30 and 30 – 45 cm) and in-vitro bio assays were performed by germinating Lettuce seeds (Lactuca sativa) (variety Grand rapids) directly on these soils. Furthermore, soils at 30 cm depth were extracted for allelochemicals using a neutral EDTA solution and in-vitro bio-assays were performed using Lettuce seeds treated with these extracts. Distilled water was used as control. Tea yield in severely affected block was zero but the moderately affected and unaffected tea blocks recorded 119 and 92 g made tea/bush, respectively, over 7-month period. The healthy seedling number of test plants was significantly (P>0.01) reduced with soils of all three depths from severely and moderately affected tea blocks compared to that of the unaffected tea block. Germination percentage was also significantly (P>0.01) reduced with soil extracts of severely and moderately affected blocks compared to that with extract of unaffected field and control. Hypocotyl length and radical length of Lettuce were lower and growth inhibition percentage of both were significantly (P>0.01) higher with soil extracts of severely and moderately affected fields compared to those of unaffected tea block. Allelochemicals exudates from old tea itself and residues of fertilizers, pesticides specially herbicides etc. added to the soil may have caused phytotoxicity in test plants when treated with soil extracts of affected tea fields and there in bush debilitation and yield decline in tea. 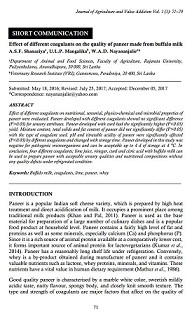 Effect of different coagulants on nutritional, sensorial, physico-chemical and microbial properties of paneer were evaluated. Paneer developed with different coagulants showed no significant difference (P>0.05) for sensory attributes. Paneer developed with curd had the significantly higher (P<0.05) yield. Moisture content, total solids and fat content of paneer did not significantly differ (P>0.05) with the type of coagulant used. pH and titratable acidity of paneer were significantly affected (P<0.05) by different coagulants and changed with storage time. Paneer developed in this study was negative for pathogenic microorganisms and can be acceptable up to 4 d of storage at 4 °C. In conclusion, four different coagulants; lime juice, vinegar, curd and citric acid with buffalo milk can be used to prepare paneer with acceptable sensory qualities and nutritional compositions without any quality defects under refrigerated condition.